Carpal tunnel syndrome presents as pain, usually described as discomfort or tingling, numbness, or pins and needles in the fingers innervated by the median nerve. This typically spares the little finger, and can be aggravated by certain positions. Carpal tunnel syndrome is caused by the compression of the median nerve from various causes, such as swelling or inflammation. Carpal tunnel is a progressive condition that worsens if left untreated, and can eventually lead to the loss of sensation and weakening of the grip in the affected hand. Professions that cause repetitive stress injury to the wrist can trigger carpal tunnel syndrome. These include cooks, painters, welders, construction workers, computer typists, musicians, among others. Interventions to reduce the repetitive stress on the wrist can prevent carpal tunnel syndrome, such as ergonomic keyboards, taking breaks in between repetitive activity, maintaining good posture and reducing force from hand tools can save the wrist from carpal tunnel syndrome. Several studies have shown that smoking, poor nutrition and obesity are consistent risk factors for carpal tunnel syndrome. Behavioral and lifestyle modification, such as smoking cessation and weight loss can reduce the severity and frequency of the symptoms of carpal tunnel syndrome. Poor physical fitness, in general, has been associated with carpal tunnel syndrome, so exercise and healthy diet can go a long way in reducing symptoms. A patient suffering from carpal tunnel syndrome needs to take a break from the repetitive activities that caused the injury in the first place. As much as possible, at least two to six weeks should be given to the wrist to heal: this rest period allows the swelling to subside, relieving the pressure that causes carpal tunnel syndrome. Oral anti-inflammatory medication is an effective intervention for carpal tunnel syndrome. Non-steroidal anti-inflammatory drugs (NSAIDs) such as ibuprofen, mefenamic acid, among others, help relieve carpal tunnel syndrome by providing short-term pain relief. This is only symptomatic treatment, however, and does not address the underlying cause of the pain. An effective nonsurgical option to resolve the swelling that causes carpal tunnel syndrome is the injection of corticosteroids into the wrist. Corticosteroids are powerful anti-inflammatory drugs that shrink the swollen tissues and relieve pressure on the median nerve. This option is typically chosen after the failure of other conservative treatments. Providing a wrist brace or wrist support restricts the movement of the hand and wrist, preventing the positions that aggravate the carpal tunnel syndrome. While this does not provide definitive resolution of carpal tunnel syndrome, it may be effective in specific situations, such as for athletes and for use while sleeping. 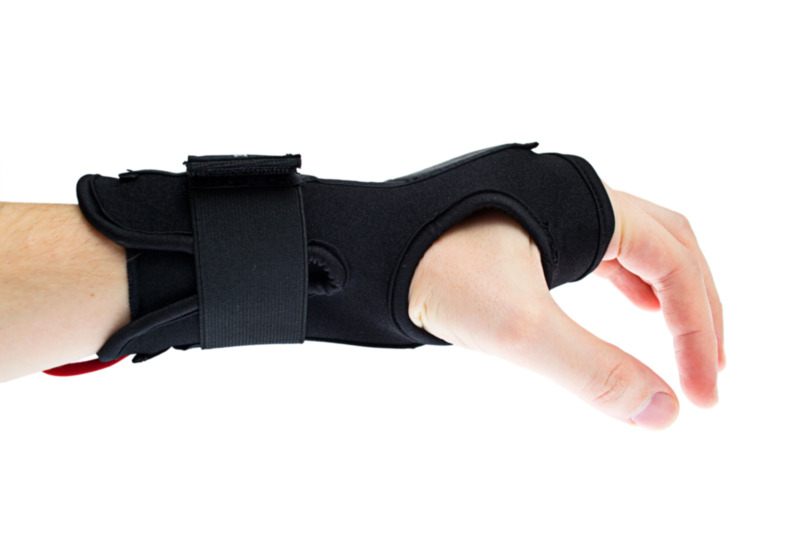 The splint is used for several weeks to months, and is usually prescribed in conjunction with hand strengthening exercises.